We looooooooooooooove pancakes in this house. Like… love love. It’s not a special occasion food for us at all. It’s more like a Monday through Saturday food (because Sundays I usually try and do something a little extra special… you know.. like cereal or something ;) . Every morning I ask Emma what she wants for breakfast. 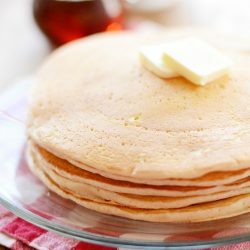 And everrrrrrrrrrry morning I think, ooooh yeah, pancakes do sound good! Which is why we have pancakes pretty much every day of the week for breakfast. Sometimes we take a little bit of a healthier route and make skinny funfetti pancakes or oatmeal pancakes or even these paleo banana pancakes. But sometimes we get really wild, toss caution to the wind, and decide to make these gigantic, bigger-than-face-sized, diner-style pancakes smothered in butter and syrup. With chocolate milk on the side. Because, duh. They’re at least as big as your face. But really, they should be even bigger than that. They’re generally on the thinner side. But they’re still VERY fluffy. 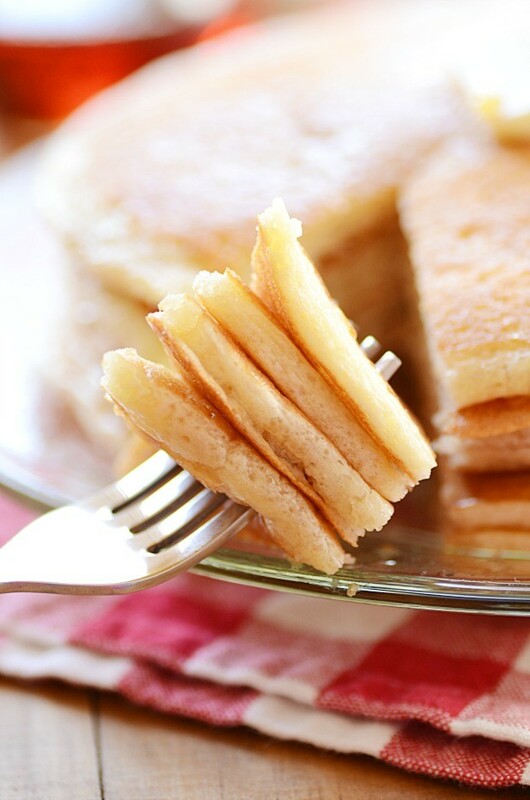 It’s a tough line to walk between thin and fluffy, but the diner-style pancake can do it! They are porous. Which is maybe the same thing as fluffy. 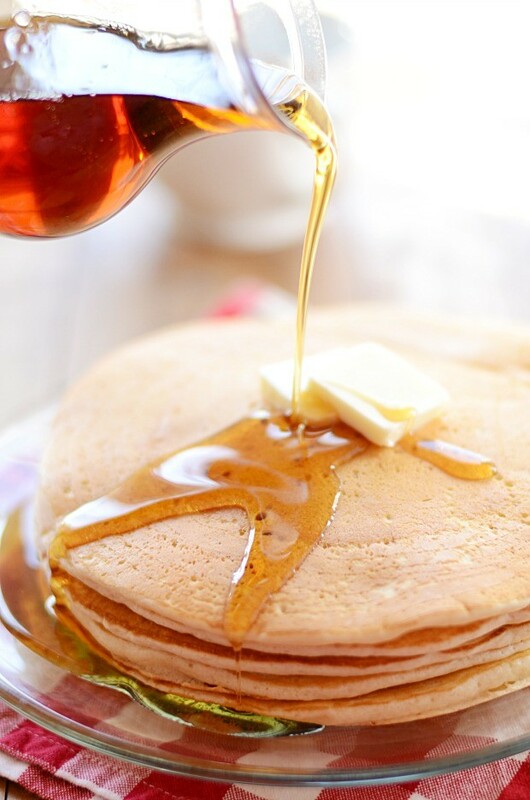 But it’s worth mentioning anyway, because I think diner-style pancakes have a distinct texture characteristic that allows them to REALLY soak up every bit of syrup better than other pancakes do. 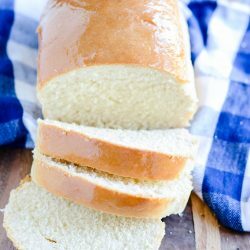 You have to spread butter on top. You just do. 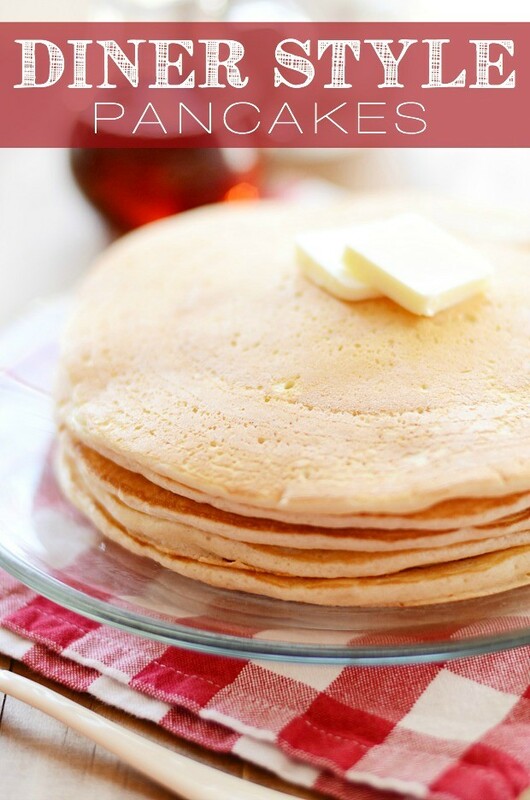 I rarely add butter on top of my pancakes, but it’s really necessary with these. I don’t know how to explain why, but it just makes the meal. This last one is kind of weird, but even my husband acknowledges its importance– diner-style pancakes have a steamy, soft exterior. Probably because they’re not always made fresh in some diners. 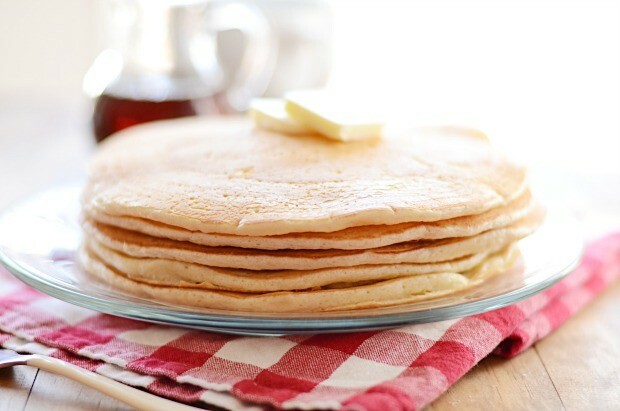 A lot of the time they’re stacked together in a heating tray, which makes them steamy instead of having a buttery crisp outside layer like a normal homemade pancake might have. Now…. just for the record, I’m not writing into the recipe that you should stick your pancakes in a heating tray to steam them. That would be weird. But if you want to know exactly how I make these for my crew… I stack them all up on a plate as I make them (instead of serving them up as they’re done). Then when it’s time to serve, they’re all nice and steamy soft. >>>>On a side note– I couldn’t post a pancake recipe without giving a little shout out to my sweet and talented friend, Karly (Buns in My Oven) whose PANCAKE COOKBOOK, Stack Happy, has just been released!!! I’ll be doing an official review and sharing a recipe here, but I just wanted to mention the book in this post too. It is incredible! These Diner Style Pancakes are as big as your face and pillow-soft too. Preheat a 10-inch skillet on medium-low heat (I set mine at 3-4). This step is important, so don't skip it! In another, larger bowl, mix together the flour, sugar, baking powder, baking soda, and salt. Add the milk-vinegar mixture, eggs, and melted butter. Mix until smooth batter forms. Lightly grease the skillet with non-stick cooking spray. Pour about 1/2 cup of batter (I use a large soup ladle and pour 1 1/2 scoops) onto the skillet and lightly spread batter into a large circle that covers the entire skillet. Allow to cook for about 2-3 minutes until you see bubbles on top that do not pop and sink back down. Use a spatula to peek and make sure the underside is nicely golden brown. Use a large spatula to flip the pancake and cook on the other side. Repeat with all of the remaining batter. For some reason, diner/restaurant pancakes just taste better. 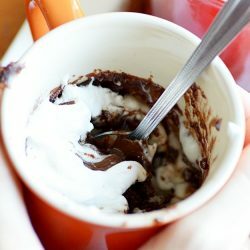 I am trying these this weekend! We LOVE pancakes too. It is not just a weekend food for us either. I like to make them with whole wheat, spelt, oatmeal, ground flax seed, chopped apples sometimes, cinnamon, and use buttermilk. I just made these yesterday. Ha!!! However, my grandkids have to have them with white flour. I thought I made big ones, but 9 inches is a whopper. HAHAHA!!! As a kid my dad would always make me GIANT pancakes like this (I used to call them “super boulder extra extra extra big big pancakes!) and yours look so perfect! Oh me too, pancakes are the best! These look so good – so fluffy! Just the way I like it. YUM!